As a jewelry designer, I have a LOT of jewelry. And I’m always looking for new and innovative ideas to showcase my collection. I’m not talking about for events or for retail displays, but for ways I can organize my own personal stash of jewels that doesn’t involve using ice cube trays to organize earrings or tossing necklaces on my nightstand. It’s a real problem! These ideas I’ve come across are some of my favorites. 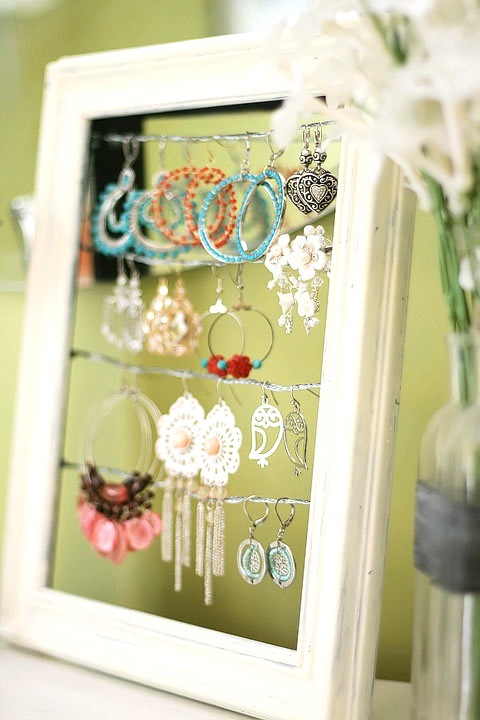 What I like most is that many of the jewelry display ideas can incorporate into home decor. So not only will you have organized jewelry, but you might just be able to fill that blank wall in your bedroom that’s been driving you crazy. I don’t know, I’m still working on solidifying all of these ideas I have twirling in my mind, but figuring out a way to display my personal collection of jewelry is my DIY project for this week. From repurposing picture frames into jewelry organizers, (which I’ve done many times— here’s the tutorial) to using something as simple as a $2 piece of chain, there are a lot of cute possibilities! Using a recycled farmhouse window, the idea of adding hooks to the top and using it as a necklace display is a fun way to spruce up a wall while keeping your necklaces hanging and organized. There’s a tutorial on how to create these, too! This idea using various pieces of driftwood in different lengths that are suspended by rope is also a really neat concept. I could see this fitting into a lot of different styles of decor, too! 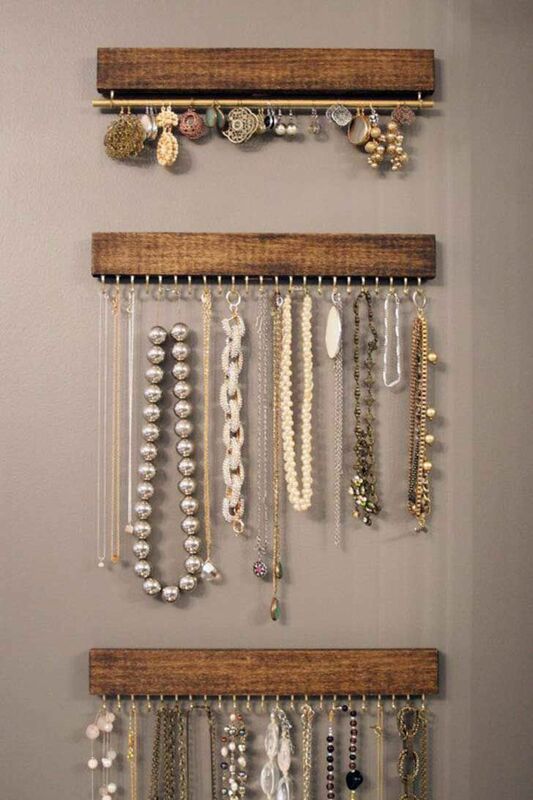 As another clever way to display jewelry, these shabby chic necklace and bracelet holders are too cute! Now this is fun and simple! By being able to choose what size branches you want to use and the size, color and type of container you display them in, the possibilities are endless! So this is my collection of white frames I had hanging in my office years ago. It served as a place to keep part of my inventory and custom jewelry orders organized and it worked quite well. If you’re looking to make something similar using recycled picture frames, here’s the tutorial I wrote. I’m digging the simplistic design of adding hooks to pieces of wood that are mounted to the wall. 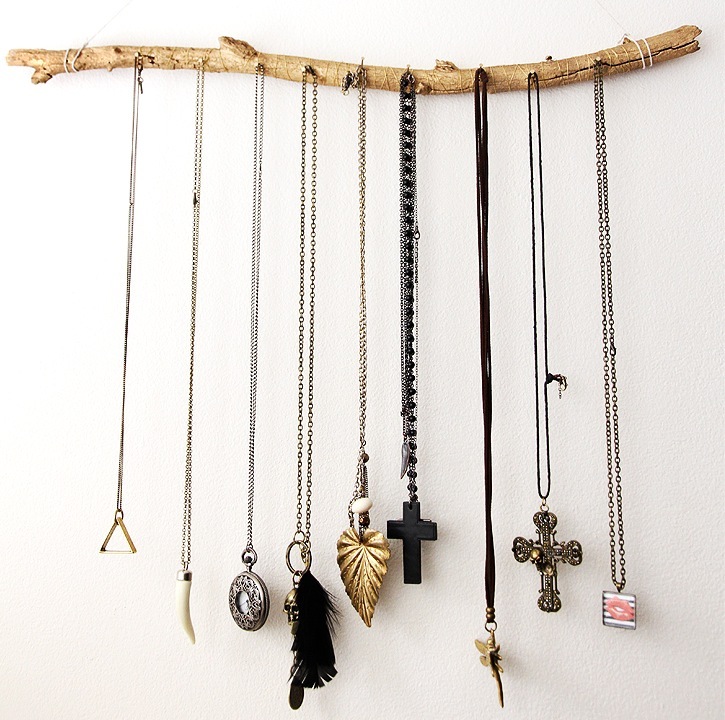 This idea would be perfect for longer necklaces! By adding small hooks to a branch, you’d be able to see exactly what you have while your necklaces are stylishly displayed. Here’s another idea using a repurposed picture frame. By adding wire to the back of it, you’d be able to easily see your collection of dangling earrings. I’m all about making something that doesn’t cost a lot of money, and this $2 chain earring display is not only is affordable, but is simple to put together. You can find the tutorial on how to make your own, here. I’m so curious, what do you use to organize your jewelry? Do you have it out on display or tucked away in a door or jewelry box? Leave some love! Your comments & feedback are always appreciated. Now that the outside is done, it's time to move our efforts to the inside. Trying to make the back of a truck feel like a store is no easy task, but we feel like we've got some pretty solid plans! TRANSFORMING THE TRUCK PHASE 3: WHOOP! THE WRAP IS ON! And that's a wrap! I'm excited to share with you the photos of the final design, the process of getting the fashion truck wrapped and what's next on the list of getting this massive project completed. Here are three simple techniques to dry out your flowers to ensure they not only retain their color but so they can be used for your sentimental Remembrance Jewelry. TRANSFORMING THE TRUCK PHASE 1: SO MANY IDEAS & A TOUR! What is Druzy Stone, Anyway?